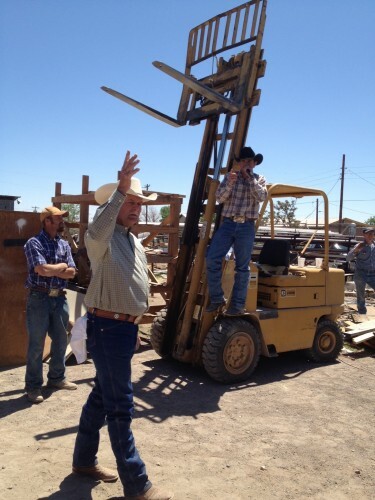 Auctioneer Bucky Etheridge salutes the crowd as Jason Owen stands on a forklift (KRTS Photo/Jennie Lyn Hamilton). An end-of-business auction took place this weekend at a onetime community fixture in Marfa, Corder Lumber and Hardware. For many in the crowd, the auction was not just about hardware, but a chance to see old friends and remember a not-so-distant past. Lorne Matalon reports.